The last couple of years have seen Sigma treat photographers to some stunning lenses that rival – and in some instances, better – those from the likes of Canon and Nikon. 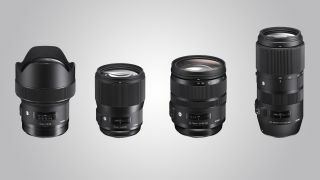 In the run-up to Japan's CP+ Photo Imaging show, which starts later this week in Yokohama, Sigma has extended its range further with three new Art-series lenses, and a new optic in its Contemporary lineup. First up is the 14mm f/1.8 DG HSM | Art, a full-frame lens which Sigma claims is the first ultra-wide-angle lens to break the f/2 barrier with a maximum aperture of f/1.8. The optic features three FLD ('F' Low Dispersion) glass elements and four SLD (Super Low Dispersion) glass elements designed to help minimize transverse chromatic aberration, while the front element is a large 80mm-diameter precision-molded glass aspherical lens that should minimise distortion. Next up is another fast full-frame prime lens, the 135mm f/1.8 DG HSM | Art. This telephoto lens is capable of capturing dramatic bokeh effects according to Sigma, as well as promising to deliver superb contrast. The lens is also designed to work with DSLRs with a resolution of 50MP or higher, with the focus mechanism featuring Sigma's floating system, which should see excellent image quality from the centre to the edges of the frame. The final new Art-series lens is the Sigma 24-70mm f/2.8 DG OS HSM | Art. This full-frame fast standard zoom lens sports an optical design to cope with the demands of ultra-high-megapixels, an HSM (Hypersonic Motor) for high-speed autofocus, OS (Optical Stabilizer), a dust- and splash-proof mount with rubber sealing, and a metal barrel. On top of the new Art-series lenses Sigma has also unveiled a 100-400mm f/5-6.3 DG OS HSM to bolster its Contemporary-series, compact-focused range of lenses. Sigma has tried to reduce the form-factor of this super-telephoto zoom lens as much as possible, getting it nearing to a 70-300mm optic in terms of size. There's a HSM (Hypersonic Motor) for high-speed autofocus, along with Sigma's OS (Optical Stabilizer) to reduce camera shake. Pricing and availability for all four lenses is still to be confirmed.